It has been suggested that an extensive contractile reserve identified recognised by means of dobutamine stress echocardiography may predict a better prognosis in patients with severe left ventricular dysfunction at rest. However, the clinical use of dobutamine stress echocardiography may be limited in patients with chronic heart failure by the substantial proportion of such patients treated with beta-blockers, since the inotropic response to adrenergic stimulation is known to be attenuated in patients receiving beta-adrenoceptor blockers. Enoximone is a positive inotropic agent that inhibits cyclic adenosine monophosphate-specific phosphosdiesterase. We therefore tested the hypothesis that enoximone may be an alternative to dobutamine in evaluating left ventricular contractile reserve in patients with systolic dysfunction on chronic beta-blocker therapy. We studied 26 patients (21 males and five females) with a mean age of 58 ± 10 years: 11 were not receiving beta-blockers (noBB group); 15 were receiving carvedilol at a mean dose of 34 mg/day (BB group). Dobutamine was infused at doses of 5 and 10 micrograms/kg/min, and enoximone at a dose of 1.5 mg/kg. The ejection fraction in the noBB group increased by 9% with dobutamine and 8.73% with enoximone (p = 0.86); in the BB group, it increased by 6% with dobutamine and 8.94% with enoximone (p = 0.03). Regional peak systolic velocities were evaluated by means of tissue Doppler imaging in four basal and four medium level segments. In the noBB group, they increased more with dobutamine than with enoximone in three of the eight segments; no significant differences were found in the BB group. Dobutamine induced non-sustained ventricular tachycardia in three patients and supraventricular tachycardia in one, whereas enoximone did not induce any repetitive arrhythmias. Enoximone might be preferable to low-dose dobutamine for evaluating left ventricular contractile reserve in chronically beta-blocked heart failure patients as it is slightly more potent and has a better safety profile. The human myocardium is a predominantly beta-adrenergic organ in which receptor density and sensitivity determine the response to adrenergic stimulation. In patients with severe left ventricular systolic dysfunction, the responsiveness of the beta-adrenergic receptor is diminished as a result of the decreased density of beta-1 receptors and the decreased sensitivity of beta-2 receptors . Rapidly growing published data suggest that the presence of a an extensive contractile reserve recognised by means of dobutamine stress echocardiography may predict a better prognosis in patients with severe left ventricular dysfunction at rest. However, the clinical use of dobutamine stress echocardiography in patients with chronic heart failure may be limited by the substantial proportion receiving beta-blocker therapy since the inotropic response to adrenergic stimulation is known to be attenuated in patients receiving beta-adrenoceptor blockers. Experimental and clinical studies have shown that enoximone has a positive inotropic effect that is not accompanied by a significant increase in myocardial oxygen consumption. It increases coronary blood flow and reduces vascular resistances. The inotropic effect of both enoximone and dobutamine is obtained via the same final biochemical pathway (an increase in intracellular cyclic adenosine monophospate) but by means of different mechanisms: enoximone acts distally to the beta-adrenoceptor, and binds directly and selectively to the intracellular enzyme phosphodiesterase III that specifically degrades cardiac cyclic adenosine monophosphate. Its effectiveness is therefore not impaired by beta-adrenoceptor down-regulation or the administration of beta-blocking agents . A number of studies have previously demonstrated the feasibility and safety of enoximone stimulation in evaluating myocardial viability in patients with ischemic heart disease [3, 4], and so the aim of this prospective study was to compare the feasibility of enoximone and conventional low-dose dobutamine echocardiography in assessing myocardial contractile reserve in chronic heart failure patients. We also evaluated regional myocardial function as recent studies have suggested that tissue Doppler is more accurate in identifying myocardial ischemia or viability than conventional stress echocardiography [5–7]. We selected patients with chronic heart failure due to advanced systolic dysfunction who were referred to our department for heart failure management or heart transplant screening. The inclusion criteria were an ejection fraction of ≤35%, sinus rhythm and a clinically stable condition during the previous three months. The exclusion criteria were myocardial infarction or unstable angina in the previous six months, significant valvular disease, and sustained or non-sustained ventricular tachycardia on recent electrocardiographic Holter monitoring. We enrolled 26 patients (21 male and five females) with a mean age of 58 ± 10 years; two patients were in New York Heart Association functional class I, 20 in class II and four in class III. The etiology of heart failure was idiopathic in 13 patients, ischemic in six, hypertensive in three, and unknown in four. Eleven patients were not receiving betablockers (noBB group); the remaining 15 were receiving carvedilol at a mean dose of 34 mg/day (BB group). The baseline characteristics of the patients were similar in the two groups (Table 1). BP = blood pressure; HR = heart rate; EDV = end-diastolic volume; ESV = end-systolic volume; EF = left ventricular ejection fraction. ; bsv = basal septum velocity; msv = medium septum velocity; blv = basal lateral velocity, mlv = medium lateral velocity, biv = basal inferior velocity, miv = medium inferior velocity, bav = basal anterior velocity, mav = medium anterior velocity. Each patient underwent dobutamine and enoximone stress echocardiography on two consecutive days; the test sequence was random. All of the patients gave their written informed consent. Dobutamine echocardiography was performed using a low-dose protocol with incremental doses of 5 and 10 μg/kg/min at 10-minute intervals; the images were taken at baseline and at the end of each infusion step. Enoximone echocardiography was performed using a dose of 1.5 mg/kg, which was chosen on the basis of the results of a previous study showing that it had 87% sensitivity for predicting functional recovery after revascularisation . The enoximone was diluted with saline to a concentration of 2.35 mg/mL in order to avoid a peripheral venous burning sensation, and infused over ten minutes. The echocardiographic images were recorded at baseline and two minutes after the infusion. During the dobutamine and enoximone studies, a three-lead electrocardiogram was monitored continuously and recorded before and after each step of the test. Blood pressure was measured at 5-minute intervals and at the end of the test using a cuff sphygmomanometer. Two-dimensional images were obtained from the apical 4- and 2-chamber views and stored on hard disk for the off-line calculation of left ventricular end-diastolic and end-systolic volumes and ejection fraction. Colour tissue Doppler images of the left ventricle in 4- and 2-chamber views were also stored on hard disk for later analysis. All of the studies were performed using a Vingmed System Five ultrasound system. The generated tissue Doppler cineloops were stored on the Vingmed Echopac System hard disk and used for the off-line determination of mean regional systolic velocities. The off-line analyses were made by a physician blinded to the test sequence. The data are shown as mean values ± SD for continuous variables, and absolute or relative frequencies for categorical variables. The mean group values were compared using the unpaired t test, and the test results within each group by means of the paired t test. A 2-sided p value of <0.05 was considered statistically significant. The computations were made using Stata 7 software (Stata Corp, College Station, TX). 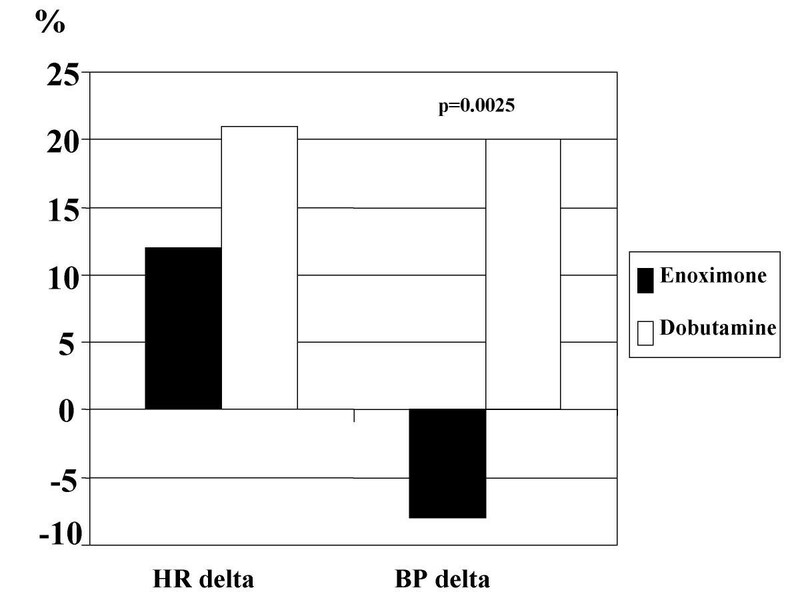 Changes in blood pressure (BP delta) and in heart rate (HR delta) in beta-blocked patients, during enoximone and dobutamine stress test. Changes in blood pressure (BP delta) and in heart rate (HR delta) in non beta-blocked patients, during enoximone and dobutamine stress test. Blood pressure increased more with dobutamine than with enoximone in both groups; in the patients not receiving beta-blocker therapy, it actually decreased with enoximone. Symptomatic hypotension occurred in three patients; it was mild (peak systolic pressure no less than 90 mmHg) and rapidly recovered spontaneously (two cases) or after liquid infusion (one case). There was no significant difference in heart rate response between the two agents. Dobutamine induced non-sustained ventricular tachycardia in three patients and supraventricular tachycardia in one, whereas no repetitive arrhythmias were observed during the enoximone test. Δ = difference between stress and baseline values; other abbreviations as in Table 1. Although the inotropic agents decreased end-diastolic volume to a similar extent in both groups, enoximone decreased end-systolic volume significantly more in the patients receiving beta-blocker therapy. 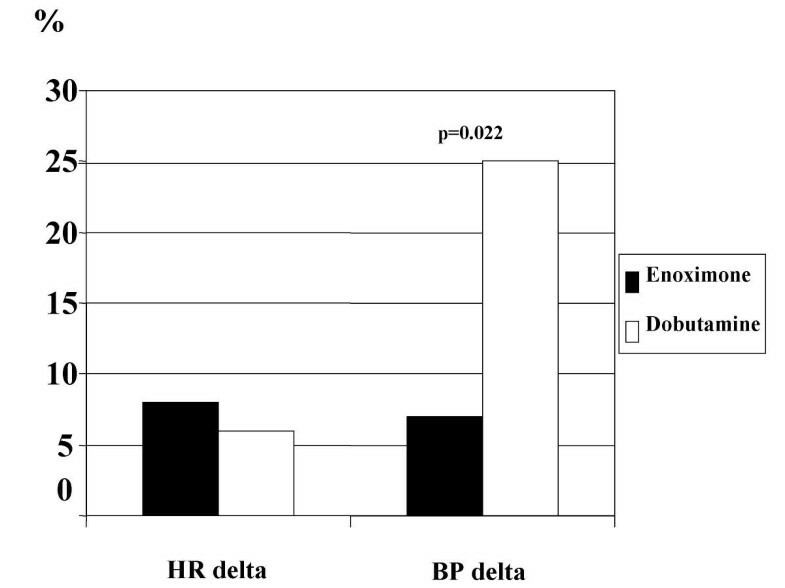 Consequently, in the noBB group, the ejection fraction increased by 9% with dobutamine and 8.73% with enoximone (p = 0.86) and, in the BB group, it increased by 6% with dobutamine and 8.94% with enoximone (p = 0.03). In the noBB group, tissue velocities increased more with dobutamine than with enoximone in three of the eight segments analysed: the basal and medium anterior segments, and the medium lateral segment. There were no statistically significant differences in regional tissue velocities in the BB group. The evaluation of left ventricular contractile reserve seems to be a promising new tool for the prognostic stratification of patients with heart failure. We tested the hypothesis that enoximone may have a better safety profile than dobutamine, and that it may be a better inotropic stimulus for patients on chronic beta-blocker therapy and therefore applicable to a larger proportion of patients with heart failure. The results indicate that enoximone does not induce repetitive arrhythmias and that it is slightly more potent than low-dose dobutamine in patients on chronic beta-blocker therapy. It has been found that an extensive contractile reserve identified by dobutamine stress-echocardiography is associated with better survival [8–11] and predicts recovery of left ventricular function in patients with recent onset idiopathic dilated cardiomyopathy [12–15]. More, in patients with ischemic heart disease and left ventricular dysfunction, the myocardial viability recognised by low-dose dobutamine echocardiography is associated with better survival . However, few of these studies evaluated patients on chronic beta-blocker therapy. The great majority of heart failure patients currently receive chronic beta-blocker therapy, which is known to interfere with the response to dobutamine: a recently published study has demonstrated that long-term carvedilol therapy inhibits the hemodynamic response to dobutamine, whereas the response to enoximone is not significantly changed . Moreover, the previous studies did not use the same dobutamine stress echocardiography protocol, with some authors using high doses of dobutamine in order to reveal myocardial contractile reserve ; however, the use of high dobutamine doses may lead to a high arrhythmic risk in patients with advanced left ventricular dysfunction. A number of studies have attempted to identify viable myocardium in patients with ischemic heart disease, and it has been shown that it can be identified after a myocardial infarction as precisely and safely by means of an enoximone bolus as by means of dobutamine infusion; the sensitivity, specificity and overall accuracy of enoximone stress echocardiography in predicting reversible dysfunction after myocardial infarction were respectively 93%, 85% and 88% . Another study used enoximone echocardiography to predict functional recovery after myocardial revascularisation, and found that it was more sensitive and had a greater negative predictive value than dobutamine, and also induced fewer hemodynamic alterations . Finally, enoximone has been combined with very low-dose dobutamine in order to detect myocardial viability in the infarcted myocardium of patients with severe heart failure and life-threatening arrhythmias . In our study, the ejection fraction increased to a similar extent in the patients not receiving beta-blockers after both low-dose dobutamine and enoximone but, in the patients on chronic beta-blocker therapy, it not only increased more with enoximone, but also (and interestingly) to the same extent as in the non-treated patients. These results are consistent with the theoretical background and the results of studies of post-infarction patients [3, 4]. We also measured regional myocardial velocities by means of tissue Doppler echocardiography because recent studies have suggested that tissue Doppler data can accurately identify myocardial viability or ischemia [5–7]. However, the information gathered by evaluating regional myocardial velocities in our patients could not replace the assessment of global systolic function. In the noBB group, tissue velocities increased more with dobutamine in three of the eight analysed segments (the basal and medium anterior segments and the medium lateral segment) whereas, in the BB group, no significant difference was observed in any segment. It is possible that the low baseline tissue velocities due to advanced left ventricular dysfunction, and the less potent inotropic stimulus (which was used to assess the presence of contractile reserve rather than to elicit the occurrence of ischemia), may explain this difference in comparison with previous studies. In terms of safety, enoximone did not induce any repetitive arrhythmias, which is very important when studying patients with left ventricular dysfunction who are, by definition, at increased arrhythmic risk. The few cases of mild hypotension occurring with enoximone rapidly resolved. One limitation of the present study is that we only enrolled patients with a NYHA functional class of no more than III. We did not study more advanced patients and we cannot predict the potential adverse effects of the two inotropic agents in such subjects. We also cannot predict the safety profile of enoximone in patients with sustained ventricular arrhythmias. Enoximone proved to be as useful as low-dose dobutamine in evaluating left ventricular contractile reserve in chronically beta-blocked heart failure patients, but its better safety profile makes it preferable for such a purpose. SG partecipated in designing the study and drafted the manuscript; CC partecipated in designing the study, carried out the stress tests and partecipated in drafting the manuscript; AF and CR carried out the stress tests, CK performed the statistical analysis; CC and LT partecipated in drafting the manuscript.